I've been reading lately about de-classifying some books - rather than labelling them 'junior' or 'YA' or 'Adult' they are in the AAA section - for Any and All readers (thanks Sheryl Gwyther for sharing that info). Examples have been the Harry Potter series with hordes of adults seen reading the books, as well as children. And how about Wonder by R.J. Palacio, and One and Only Ivan by Katherine Applegate - so great that they shouldn't be restricted to the 8 to 12-year-olds. Picture books too have a large adult audience, whilst the format is often assumed to be for children, and little children at that. This couldn't be further from the truth, as anyone who knows picture books well understands, there are many which should be read by all, shared between the generations and pored over for their wonderful design and illustration, their language and ability to say much with few words and pages. When I picked up the beautifully cloth-bound The Fox and the Star by Coralie Bickford-Smith, it was clear from first glance that this was something special, something very high quality, and the contents didn't let me down. From the perfectly balanced white print on the cover and the densely patterned end papers, a forest of trees, and the creamy weight of the Munken Pure Rough paper, to the story itself and the gentle character of the fox, with just the right touch of magic. The typography is carefully laid out, the illustrations vary in scale from the distant star in the sky, to a deliciously orange close up of Fox's face, cutaway perspectives show his home underground, and the message - a marvellous double-page spread where the text is spelled out in leaves - "Look up beyond your fears". What better advice could there be. It is obvious that every element of the book was carefully chosen to make the most perfect package possible. This is what we should have known to expect from book design pro Bickford-Smith. She's the name behind many exquisite covers for Penguin including the Hardcover Classics series. The Fox and the Star is published under Penguin's imprint Particular Books. 'Particular' seems a good word here - a couple of definitions I found for it were 'especially great or intense' and 'a detail'. She is very particular about the detail. Pattern rules throughout the book, I wasn't' surprised to read that Bickford-Smith has a great fondness for the work of William Blake; that influence is clearly seen in her work. It takes a fastidious designer to build such detailed patterns that fit together so precisely, and with the added magic of the skilled illustrator to ensure the patterns do more than just look good, they have purpose, they are very much part of the story. 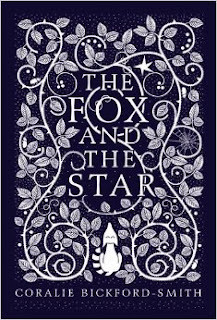 The story itself is of young and timid Fox who loves to look up through the trees at Star, who becomes his only friend, helping him seek out food, lighting his way on his nocturnal adventures. But then things change (I guess that winter arrives) and star can no longer be seen. Fox is bereft and takes to his den underground. When beetles on the move underground stir him he heads out to find Star. This is his greatest adventure but I won't spoil the ending here. Coralie Bickford-Smith has provided a great look into her process on the Creative Review blog that's definitely worth a read, and to see her sketches and design workings. You can see the wonderful array of bookcovers and more on her website too. My love for children's books is as much for the design as for the stories and pictures; this book rings my bells on all counts. A beauty. I'm not the only one who thinks so - it's also the Waterstones Book of the Year. I borrowed my copy from the library, but will definitely have to get a copy of my own, and probably a couple as presents too, and not just for children.